Aquatherm's Blue Pipe system was chosen, due to the system’s cost savings, simple installation, and long-term reliability. "As a mechanical contractor, (SI is) very familiar with copper and carbon steel, which would have been the traditional choices for this application; however, we decided at the beginning of the project to use Aquatherm." Polypropylene does not scale or corrode and provides improved flow rate, which results in energy savings. The heat fusion process results in joints that are engineered to last over 50 years. Unlike copper, Aquatherm's polypropylene pipe offers stable pricing, and no theft value. Southland Industries' staff designers sought to minimize waste and maximize value while targeting LEED Gold Certification on a new addition to the company's main campus. Aquatherm's Blue Pipe system was chosen due to the system’s cost savings, simple installation, and long-term reliability. At Southland Industries (SI), developing and applying superior solutions has been integral to customer success since 1949. The Garden Grove, California-based company is one of the nation’s largest mechanical contractors providing full design, construction, fabrication and maintenance services for HVAC, process-piping, plumbing, fire-protection, controls and automation systems, with a reputation for developing and applying superior solutions. 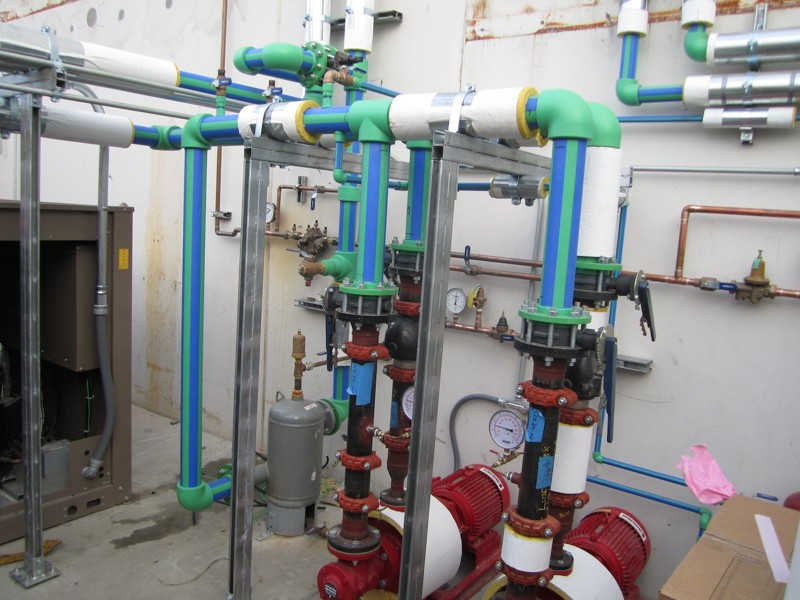 So when staff designers had to select a piping system for a new addition to the company’s Garden Grove campus, Aquatherm polypropylene-random (PP-R) pressure systems were a natural choice. A champion of “lean construction” as a means of minimizing waste and maximizing value, SI singled out Aquatherm products to help achieve its target of LEED Gold Certification. Part of SI’s Southern California Division, the new 37,500-square-foot building is divided into a high bay area with open-plan workstations and collaboration areas for engineering and planning as well as a two-story area for offices, conference rooms, a break room, and restrooms. The structure also houses the main data center serving all of the company’s California and Nevada offices. Independent of the building system, the data center features a dedicated in-rack cooling system with air-cooled condensers. Although the construction plans called for many environmentally friendly features, such as extensive day lighting, low-power-density lighting and a direct-digital-control system to monitor the energy use of all lighting and HVAC systems, “we viewed Aquatherm piping as a unique opportunity to add a green piping system as part of the new facility,” said Peter Pobjoy, PE, SI’s chief design officer. SI opted for Aquatherm’s Blue Pipe piping system, using between ¾-in. and 4-in. 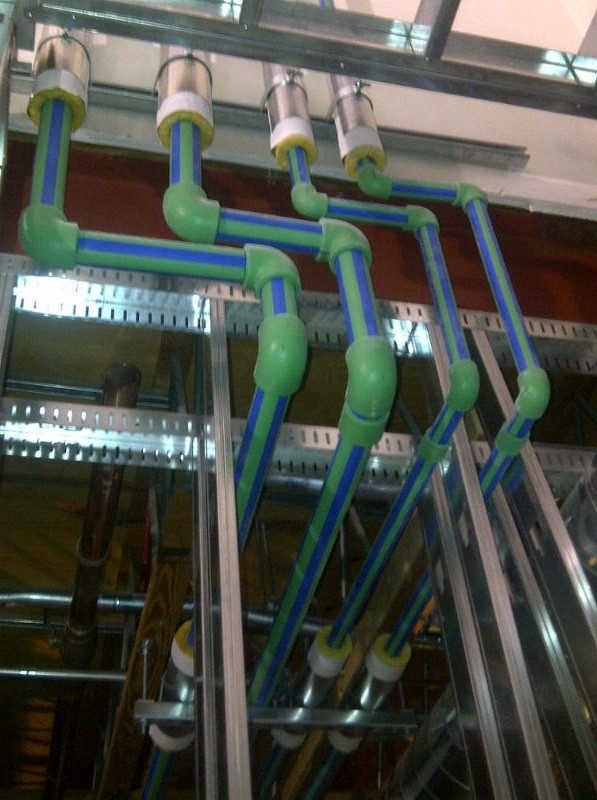 piping for the building’s heating-hot-water and chilled-water lines. A four-pipe distribution system was specified to deliver sensible chilled water and heating hot water to the building’s terminal units and one Aaon AHU through variable-speed pumps. A central 50-ton York air-cooled chiller was selected to provide sensible chilled water at 55˚F while a Raypak natural-gas-fired condensing boiler furnished 140˚ heating hot water to the terminal units and AHU. Three Aaon 100% dedicated outdoor-air systems (DOAS) with direct-expansion (DX) cooling and hot-gas re-heat designed to deliver outside air to all spaces through the terminal units, which also maintain humidity levels. A Price Industries displacement-ventilation (DV) system for the high bay area served by a roof unit delivering 64˚F supply air-to-air distribution outlets constructed into building furniture. Price fan-powered induction units (FPIUs) with electronically commutated motors (ECMs) serving the private offices, open offices and conference rooms. Fourteen Price active chilled beams (ACBs) split into two control zones serving the open-plan workstations. Aquatherm’s Blue Pipe is specially engineered for hydronic, geothermal and industrial applications. With the optional faser composite layer and a natural R-value of 1, Blue Pipe is also high-heat stabilized, allowing it to be manufactured as SDR 11 instead of SDR 7.4, reducing the piping system’s weight and further improving flow rates. “As a mechanical contractor, (SI is) very familiar with copper and carbon steel, which would have been the traditional choices for this application; however, we decided at the beginning of the project to use Aquatherm,” Pobjoy said. While copper pipe prices fluctuate with the market, Aquatherm PP-R systems are quite stable, and typically cost less than copper – and PP-R has no theft value, meaning it won’t be stolen for scrap. Additionally, Aquatherm’s unique heat-fusion welding techniques provide more reliable joints and seams. Heat fusion bonds both sides of a joint into a single, homogenous material without the use of chemicals or mechanical connections, which eliminates systematic weaknesses and fail points in the pipe. “There was a learning curve associated with the installation of the Aquatherm system at the beginning of the project, but as we progressed through the installation and learned what worked best for our installation, we picked up speed and productivities increased,” said Steve Fosdick, SI’s construction manager. SI used fusion welding equipment provided by Aquatherm’s local manufacturer’s representative, Sustainable Building Products (SBP). SBP is a master distributor of environmentally friendly building components and emerging technologies. The company was founded to meet the demand for sustainable, affordable building solutions. SBP helps bridge the gap between innovative manufacturers and environmentally conscious end users. SBP sales representative Marty Hayes presented Aquatherm to SI. “I’ve been working to get them onboard for a couple years now to and it finally clicked on this project. They saw the value and the multiple benefits,” Hayes said. SI targeted LEED Gold Certification during the design phase of the project in August 2011 and maintained the goal all the way through occupancy in February 2012. Blue Pipe assisted in the eco-friendly aspects of the project because it resists the scaling and corrosion that reduces the performance of other piping systems. The walls of the PP-R piping systems generate less friction than other systems, eliminating the abrasion that can cause pin-holing and shorten the lifecycle of the pipe. The heat-fusion joints maintain the same properties as the pipe itself, so physical stresses will not damage their integrity. Overall, the Aquatherm piping systems last longer with less maintenance than other systems, adding greater value to each installation. 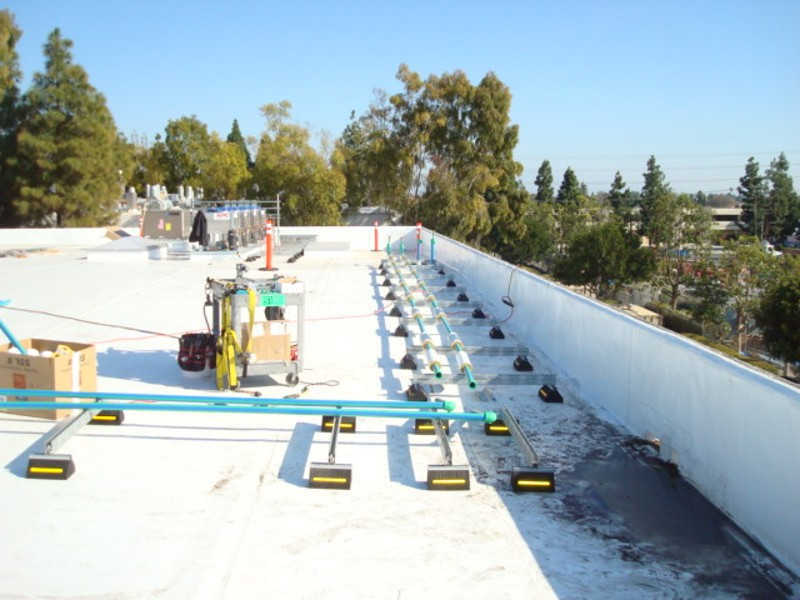 “Aquatherm and SBP provided excellent support throughout the project,” Pobjoy added. Fosdick and SI management was so happy with their choice that “they left the chilled-water supply line uninsulated and exposed so they can show potential customers the Aquatherm system,” Hayes said.